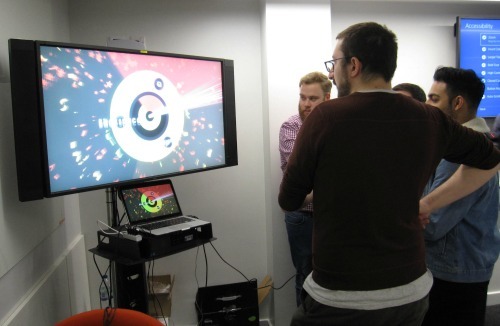 After a break for Christmas UXPA were back with an event called UX and Video Games. As I am not a big player of video games, generally because I am not very good at them and I do not have the patience to get good at them, I was interested but unsure how much I would take away from it. 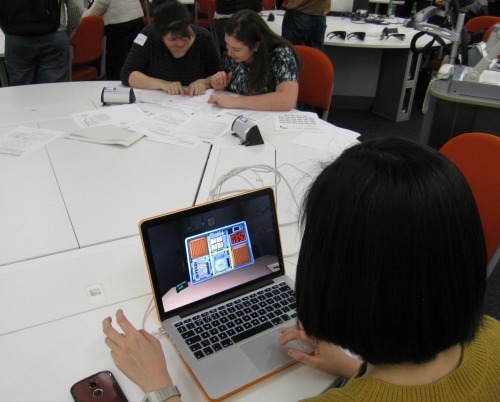 However the three speakers were all excellent and the addition of a pre-talk game session added to the interest. I was also at the event as a volunteer, taking photos. The pre-talk game session was really interesting with a selection of different types of games, including various VR headsets, a game which seemed to involve stacking strange shaped animals on one another to gain points, and a game were you had to try and disarm a bomb as a team, where one person could see the bomb while the others have the manual. Trying to disarm the bomb! Then it was time for the talks. 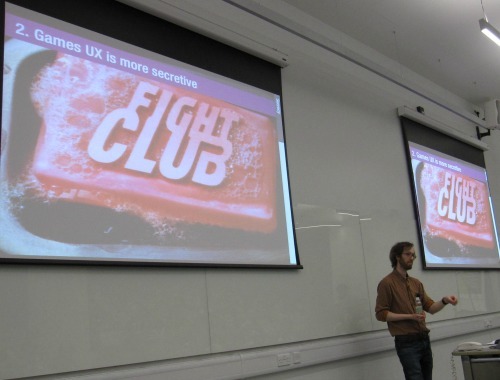 First up was Alistair Greo from Player Research talking about the differences between 'mainstream' UX and Game UX. Alistair felt that in moving from 'mainstream' UX to Game UX he had lost two things but gained four. He thinks that game UX is much less mature meaning less UX methods are used, there is less buy in and there is less budget. He also found game UX to be much more secretive meaning that it is much harder for teams to talk about UX and how it might help. However he feels he has gained much. For instance, research questions are much more interesting. Game UX is about feelings. UX and the creative teams working on the games are more passionate. And game UX gets all the cool tech. He said his biggest challenges were while there might be method crossover the solutions will be very different, and it is hard to show a return in investment as you cannot see how the game would have done if they had not added UX. 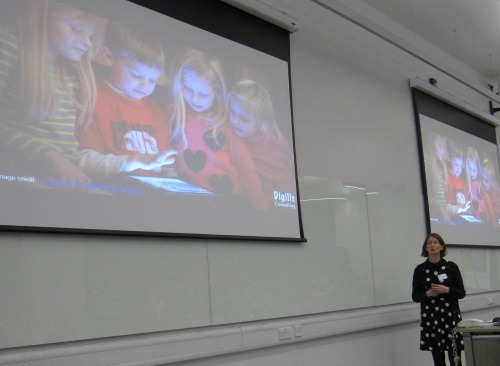 Lucy Gill, from Digills Consulting, then spoke to us about childrens game development. Due to frustrations with apps for her child she created The Good App Guide. A quarter of the apps she tested failed, meaning children could not use the game. Lucy spoke of the key things needed to create a good game for children. Unsurprisingly the first thing was to know your audience. Children go through massive changes in small amounts of time, so making an game for 2 - 10 year olds is going to be a real challenge. You need to know what counts as fun for different age groups and how they actually play. She suggests testing early, making sure you know what you want to learn so you can ask the right questions, and don't just go on what the child tells you, watch what they are doing and their body language. She also spoke briefly on how these types of games are now helping children with issues like Dyslexia and Autism, which led well to our last speaker. Last up was Mark Friend from Sony, talking about accessibilty in games. As I have said before by making things accessible we help everyone and this goes for games as well. Mark started by explaining the types of issues they look at. These include issues with receiving stimulus, for instance issues with vision or hearing. Issues with processing, so cognitive issues and issues providing input, for instance motor skills or speech. 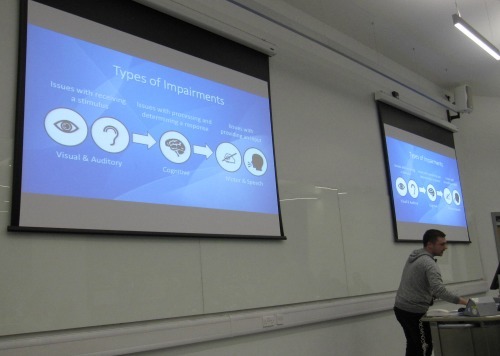 He then gave some examples of how games could be modified to make them accessible without dumbing them down. Firstly allow information to be communicated in different ways, for instance not just using colour but including patterns. Secondly offering flexibility, for instance allowing controllers to be customised to allow a user to group buttons or hold down buttons instead of rapid clicking. These things will not just benefit colour blind players or players with motor impairments, but others such as players using smaller screens or left handed players. Games allow us to do things we cannot do in real life, so why should we stop anyone being able to do this? It was a really interesting evening, even for someone like me who does not play many games. It will certainly make watching my husband play on his Xbox more interesting.